I never used to be into cooking. I considered it the greatest tyranny of raising children -- they needed to be fed, multiple times per day. Three square meals and a couple of snacks. One of our sons was especially tough to feed -- we called him the Hydroponic Kid, because he preferred drinking to eating. His favorite vegetable? Celery. But when my boys were teenagers, I wanted them around. I discovered if I filled the kitchen with foods they and their friends liked, and hid my chocolate, there were teenagers everywhere, clomping around on big feet, yelling, playing music and eating everything, like a swarm of locusts. I made huge vats of beans and rice on the weekends so the meal could expand. Our other son became the identified Feeding Problem. Vegetarian. I adjusted. He went vegan. He had to help with dinner three nights a week. Only so much chopping of vegetables I was willing to do. And now? Without any kids to feed constantly, I'm into cooking. It's become a pleasure. 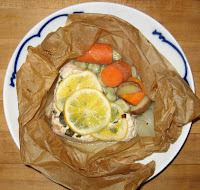 Tonight for dinner I made Parchment Paper Chicken, following my friend Karen Kashkin's relaxed recipe. It's basic: boneless skinless chicken breast, some vegetables (I used potatoes I dug up in the garden planting new vegetables over the weekend, fava beans wint ered over, onions and carrots). Chopped up some oregano and sliced some Meyer's lemons on top, and rolled the whole thing into parchment paper. I'd never done this before and wasn't sure the paper would stay rolled up, but it did. 20 min at 425, and the moistest, most delicious meal emerged from the paper. Easy. Besides, the little packets are gorgeous, and kind of like getting a present, right there on your plate. You get to open it up and see what's inside.